Nelson Steel Products is a manufacturer of treadmill parts in Holland, MI. 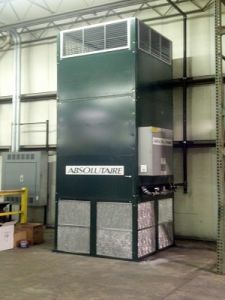 Their new facility was in need of an air turnover system to keep the space at a comfortable 70 degrees F year-round for production employees, and they chose an E-Series dired-fired air turnover system to accomplish this task. The E2-10-20 uses only 3% OA to provide warm air to the warehouse, making it an environmentally friendly and energy-saving system. The unit was mounted against an exterior wall and was designed for 3-sided inlet and return. The 5 HP direct-drive axial fan makes the unit incredibly quiet so as not to disrupt production in the facility.